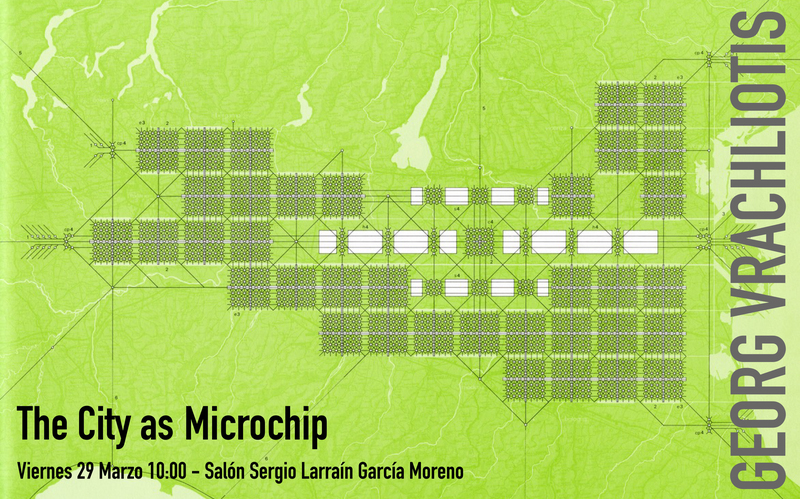 Conferencia "The City as Microchip" del profesor de teoría en el Karlsruhe Institute of Technology de Alemania, Georg Vrachliotis, en el marco del curso "Arquitectura y la Tradición Moderna" del profesor de la Escuela de Arquitectura UC, Horacio Torrent. The lecture "The City as Microchip", will discuss the radical proposals of Swiss Architect Fritz Haller (1924-2012), friend and colleague of Konrad Wachsmann. Haller is primarily remembered for his design of the modular furniture system USM. However, this furniture system was in fact only the modest demonstration of a much larger theory concerning urban planning at a planetary scale. This urban theory were nothing less than one of the most enigmatic and perhaps last attempts in the 20th century to create an outline for new forms of perception about infrastructural space and landscape and to transfer that which is technically invisible into a geometric form. Georg Vrachliotis is Professor of Architecture Theory and director of the saai | archive for architecture and civil engineering at the Karlsruhe Institute of Technology (KIT). He was appointed Dean of the Faculty of Architecture in 2016. He is the curator and (co)author of "Architecture and Technical Thinking in the Age of Cybernetics" (2009), "Structuralism Reloaded. Rule-Based Design in Architecture and Urbanism“ (2011), "Fritz Haller. Architect and Researcher" (2014) and of "Frei Otto. Thinking by Modeling" (2017).